The name Practical Life refers to the fact that the activities and objects in this section are inspired by the everyday activities children might be observing at their home such as washing up, pouring, grating, polishing etc. Children have a natural tendency to copy adults’ actions but often in a home environment it is not always possible to let children perform all these actions by themselves and for themselves. 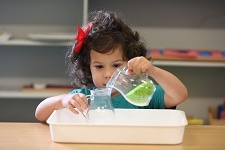 In a Montessori classroom children have the freedom to perform these actions until they have satisfied their curiosity and inner drive. Children are not interested in achieving end results as quickly as possible, but are far more interested in the learning processes. As a result they will happily repeat exercises again and again until they feel satisfied. Practical Life activities are usually the first activities children are introduced to when they arrive at Montessori nursery. Children are drawn to these activities because they represent a link to the home environment. Early PL activities such as spooning serve to spark children’s interest and to increase their self-confidence allowing them to tackle more and more challenging tasks. The activities progress from simple dry pouring to pouring through a funnel into different containers and from spooning to transferring and sorting with tweezers. On first glance PL activities seem to provide children with basic skills, however their function goes beyond simply teaching the child to pour or tie the shoe laces. All activities are also helping children to develop good work habits, concentration, hand-eye coordination, a lengthened attention span and control of his/her body.